Preheat oven to 230˚C (450˚F). Place beef in roasting pan. In small bowl, mix together 1 tbsp (15 mL) olive oil and the paprika, cumin and oregano. Brush mixture onto the meat. Roast 20 min., then reduce oven temperature to 160˚C (325˚F). To cook to rare, roast another 25 to 30 min. 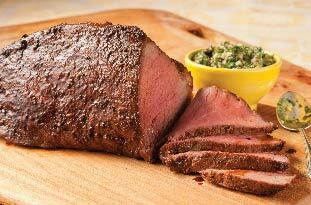 For medium-rare, roast another 30 to 35 min., or until an instant-read meat thermometer reaches 63˚C (145˚F ). Or cook to preferred doneness. Transfer roast to a plate; brush with pan juices. Tent with foil; rest 10 min. Thinly slice roast and serve with salsa verde (below), if desired. Hundreds of expert tested recipes to browse, try and taste.